Azure Hills Inn & Suites features room service (during limited hours). Public areas are equipped with complimentary wireless Internet access. Onsite self parking is complimentary. 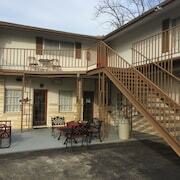 Situated in Fredericksburg, this motel is within 1 mi (2 km) of Whistle Pik Galleries and Fredericksburg Winery. National Museum of the Pacific War and Rockbox Theater are also within 1 mi (2 km). 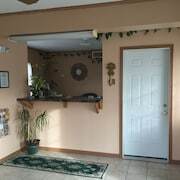 All 24 rooms provide conveniences like refrigerators and microwaves, plus free WiFi and cable TV. Other amenities available to guests include room service, ceiling fans, and desks.